TROY, Michigan, January 18, 2018 – SSOE Group (www.ssoe.com), a global project delivery firm for architecture, engineering, and construction management, is proud to announce that they provided architectural and engineering services to Henry Ford Health System for the installation of the world’s first FDA approved commercially available linear accelerator (LINAC) based, magnetic resonance imaging (MRI) guided radiation therapy system that can image and treat patients simultaneously. 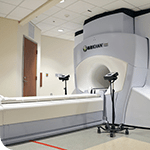 The ViewRay MRIdian LINAC / MRI system, recently installed at Henry Ford’s Medical Center – Cottage in Grosse Pointe Farms, Michigan, is the first in the world to offer patients an advanced radiation therapy with real-time MRI and LINAC delivery for more precise and accurate radiation treatment. The previous ViewRay installations used cobalt as a radiation source. This new technology provides the capability to simultaneously use diagnostic imaging with the MRI component and LINAC radiation treatment. The advanced MRI imaging will help Henry Ford physicians provide greater accuracy in delivering radiation to a cancerous tumor. Henry Ford Health System chose SSOE to provide A / E services, including the removal of one LINAC and the installation of the new ViewRay MRIdian LINAC / MRI system in an existing vault on the main floor of the medical center. In this particular installation, additional concrete shielding for the LINAC was needed to provide radiation protection to the surrounding environment. SSOE worked with Henry Ford’s team of physicists to augment the existing shielding which involved designing supplemental floor to ceiling concrete walls to reconfigure the existing vault. Additionally, SSOE designed a copper fabric enclosure within the vault for radio frequency (RF) shielding of the MRI component. SSOE has been a trusted team member to Henry Ford Health System for 20 years. In addition to this project SSOE also provided A / E services for yet another ‘first’, the Varian EDGE Radiosurgery System located at Henry Ford Hospital in Detroit, Michigan. At the time of installation, this system was the first-of-its-kind EDGE radio surgery LINAC in North America – second in the world. With this system, Henry Ford is able to quadruple patient treatments while reducing the number of visits due to its accuracy in treating cancerous tumors. Click here for more on this project. SSOE’s highly trained and accredited healthcare team includes professionals who excel at all stages of healthcare projects—from strategic master planning, architecture, engineering, and interior design to construction management. SSOE has experience providing these services to all types of healthcare facilities including cancer centers, acute care hospitals, community hospitals, academic medical centers, specialty clinics, labs, and medical office buildings.